Cut four ribbons, about 25 inches each. Lay three ribbons in a grid pattern on a work surface: two vertical and one horizontal across the top. Place the box on the grid. Start to tie a bow in the top left corner with the two ends of left ribbon. Pull left end of horizontal ribbon across the box so it lies across the bow. Finish tying the bow, capturing the horizontal ribbon. Start to tie a bow in the upper right corner with the two ends of the horizontal ribbon, laying the right vertical ribbon across the bow halfway through; finish tying the bow. 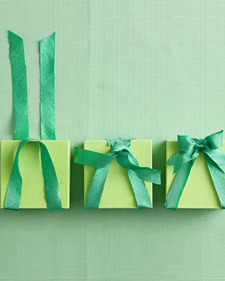 Lift the box and slide the fourth ribbon underneath horizontally. Start to tie a bow with the two ends of the vertical ribbon in the bottom right-hand corner. Pull the right end of the horizontal ribbon so it lies across the knot. Finish tying the bow. Slide one end of the horizontal ribbon under the left vertical ribbon and tie the two remaining ends in a bow. Tighten all bows and trim ends. Fold the ribbon in half and place on the work surface with the fold at the bottom. 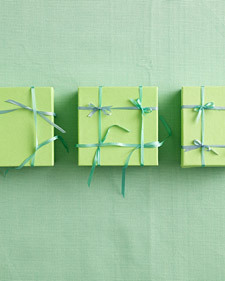 Place a favor box on top of the ribbon, and pull the folded end up to the top of the box. Thread the two remaining ends of the ribbon through the loop of the folded end. Center the loop at the top of the box, and slide the bottom pieces of ribbon to each corner to create a triangular shape. Pull the ribbon taut, and tie the two ribbon ends into a bow. Notch the tails of the bow by pinching each end of ribbon in half, and then cutting at an angle to make a deep V.